« What appliances can I run from my motorhome or caravan solar power system? This is a very common comment I see in both emails and forum questions. Depending on the size of the solar/battery system, refrigeration can account for up to 70% or more of the total power requirements. In our motorhome we have a 220ltr low voltage, two-door fridge/freezer and a small (40ltr) chest fridge that becomes a freezer when the fishing has been particularly good. Together these two units consume about 40ah (at 24v) every day (80ah @ 12v). Why is it then that many people are reporting that their refrigerators are using more power than they expect? The majority of portable fridges are powered by Danfoss compressors (or in some cases a Chinese made copy). These little compressors are amazingly efficient. The most common size of compressor is a called a BD35F – so let’s look at this compressor first. The BD35F will draw between 1.5 and 6.5 amps (@12v), depending on the speed (RPM) and the temperature. Generally, most fridges are shipped with the compressor configured to run at full revs all of the time – some have a switch to allow selection of high or low speed. Ideally your fridge compressor should run for approximately 20 minutes before the thermostat stops the compressor (of course there are lots of factors that can alter that – ambient temperature, heat loading etc). The compressor will run less in the cooler night time conditions when the door is not being opened and more often and for longer in the heat of the day. A good basis for calculations is an average of 20 minutes run time every hour. This equates to about 53 amp hours every day (@12v). You have your thermostat set too low. This is very common. The sensor for the thermostat is normally located in the freezer compartment. Turning this down (often in an effort to get the beer in the fridge compartment cooler) will result in the compressor working overtime trying to freeze the items in the freezer compartment well below the recommended minus 18degC. A large build-up of ice inside the fridge compartment is another good indicator that you have the thermostat set too low. Place a digital thermometer inside the freezer (ideally one with the display located outside the freezer compartment). The correct temperature is minus 18 degC. 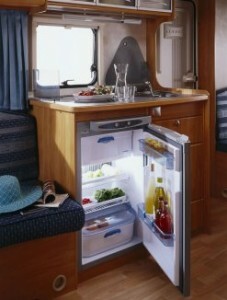 The fridge compartment should be about 4 – 5degC. The seals around the door(s) are not completely sealing. You can test this with a piece of paper. Shut the door with the paper in the seal, if it can be removed without resistance, the seal is faulty – test right around both doors and replace if necessary. Airflow is essential. The fridge is designed to remove the heat from inside and get rid of it. If it can’t get rid of it efficiently, it won’t be able to remove it efficiently. There must be good air-flow around the cabinet and both under and behind the refrigerator. Some fridges are designed to dissipate the removed heat through the side walls – it is a BIG mistake to add insulation to sides of these types of fridges. If your fridge is running almost all the time, there is one other possible reason – if the compressor speed has been set to something other than full speed (3,500rpm) and the ambient temperature is quite high (say above 32degC), the compressor may struggle to bring the internal temperature down far enough to allow the thermostat to turn off. Check that a select switch has not been bumped. Don’t place hot food items directly into the fridge. Don’t allow the sun or other heat source to warm the exterior of the fridge. A full fridge will consume less power than an empty one (due largely to the loss of cold air when opening the fridge door). This entry was posted on Thursday, May 29th, 2014 at 5:13 pm	and is filed under Caravan, Electrics, Motorhome, Power, Refrigeration, Solar. You can follow any responses to this entry through the RSS 2.0 feed. You can leave a response, or trackback from your own site. Love your site and commend your efforts to inform others. I have done my time and now escaping. I have a Hiace poptop camper. I want to use solar but the options are daunting for me. I do not live in this vehicle but it is nice to get away and free camp. Obviously expense versus practicability is important. I have purchased a 100aH AGM battery which is charged via alternator. It is not enough charge unless I keep moving on after 2 days. I run a few LED lights, pump (for water to sink) and Engel 12v 14litre freezer using .5-2.5amps. I have an Electrolux RM4200 3 way fridge running on gas. I choose to park in shade where possible. I don’t really want to store a portable solar panel. Please advise what you would suggest. I am willing to mount on the top and have clear space on the poptop. I am concerned about providing air space under panel and its windload (safety issues). A few hundred watts of solar on the roof would make a huge difference (it will also extend the life of your battery considerably). There are some great new plastic mounting kits that would be perfect for your pop-top. They are low-profile but do allow for air movement under the panels. Solar is so cheap these days, there is little reason not to cover the roof. The reduced engine loading (due to the alternator not having to work so hard) will go some way in offsetting the additional wind loading. I suggest reading and following the instructions provided in the article. “sometimes” has no meaning when calculating power use. “TV” – what TV? – how many watts? for how many hours (TV draw between 5 and 700 watts). “LED lights” – how many?, how many watts?, how long each day? Careful planning and accurate calculations lead to successful results. Hi Hobo. I am in the process of building a teeny tiny RV in my Kia Carnival. I love it to bits so far and get excited every time I look at her. My question is I want to run a very small fridge, large fan, laptop and printer plus microwave and electric hot plate. I have no idea about solar but was thinking of putting two 250watt panels on the roof with 4 batteries. Do you think this will cover everything? I am trying to get my head around watts and a/h but its all so confusing for me. This sounds like a great project. I understand that this sort of thing can be hard to get your head around. 250w panels are not generally a good idea for on a motorhome – they are so large that the glass flexes inside the frames and this can (and has) caused them to shatter. Also an electric hotplate is not really practical in a small motorhome – you will not have the roof space or the load carrying capacity to support the solar array or the battery bank required. Gas is a better option for cooking. Microwaves are ok if they are used correctly. A microwave oven will however have a large impact on the sizing of the inverter you select. If you are interested, I offer a very economical, paid, electrical design service. I first get a very good understanding of what you want to achieve with the project, your budget and how you plan to travel. I then design the most suitable electrical system and provide diagrams, parts lists and recommend makes and models of equipment and provide detailed explanations of why these items were recommended. Email me for details if you are interested.